Home» Security Tips » [Security Tips] How to recognize and avoid a phishing page? [Security Tips] How to recognize and avoid a phishing page? Hello Friends, As you all know, in today's time, the whole world is using the Internet. Because nowadays most of our work is going on from the internet, Friends, I am going to tell you today how do you protect yourself all over the Internet? We are working mostly on the internet nowadays and if we do not have any information relating to Internet safety then problems can occur. Friends What happens in the phising attack? In this we can not pay attention and make mistakes in it, and put all your necessary and important information in danger because if this phishing attack works properly then from your bank account to your email id, twitter id and Their username and password are sent to all third party. It is very important for you to know as much as possible about the phishing attack. I believe that there will be no mistake in any way, so I will tell you everything that is related to phishing attack. so I will tell you everything that is related to phishing attack. 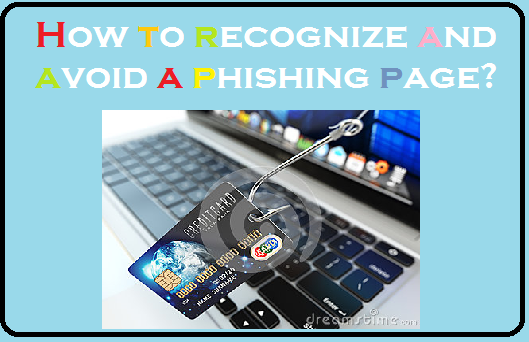 So friends Today, we will tell you about a new method of phishing attack, which only professional people are aware of, because these phishing attacks are very difficult to avoid and they also get involved in identifying them, so that any person has their nets But when friends tell us about it, you can also avoid them, but they can recognize them well. Friends today are moving forward in the world of technology like us. In the same way, related crime is increasing with internet and technology. So Friends, we can avoid such criminal activity by having accurate information about using internet and having accurate information about cybercrime. If you have to know about the phising attack or how to avoid it, then you can read this post to the last. So friends know now what kind of phishing attacks can they be? Friends, as you all know, nowadays we go shopping on all the E-Commerce Websites. Because we get a lot here. As I told you that those who are hackers take care of everything that is of their own benefit and that they can hack your account, through which they can steal all your information, and for them E- Where to get good information from the Commerce Website means that it works like a platform for them. Whichever cyber criminals are, they first see your interests from e-commerce websites, what is the interest to you, they make their phishing page related to it. Friends, when you use the Internet, sometimes you suddenly pop up in front of you, and seeing an antivirus warning appears in front of you, and then he tells you that the virus has come to your computer. You clean it and he will clean it. The option is given and when you clean it several times, it looks faill in your computer, it tells you that you have to remove it from the antivirus Please install it. As soon as you click on the antivirus it gets installed on your computer. It is not really that antivirus, it is a real virus that stole all the information from your computer and sends it to a third party. To avoid if you delete that entire page, by doing so, the popup that goes away. Friends These phishing attacks are the most on the website, when we search something on a website, the help desk page opens on our page. When searching for something and we are not getting it, do not we take help from the help desk and when you get help desk help, which is a phishing page in the realty. He asks for some personal information from you and you understand the formality and enter it so that all your personal information is stolen and you reach the attacker and you do not even know, you just think that due to some reason or fault This page is not open next. Friends such a phishing attack is via email, when visiting a phishing website, they entice you with a trick that lets you in some way put all your financial information in it. But if you know about the phishing attack, then normally no one can harm you from the phishing attack and you will be able to keep yourself safe from such a phishing attack. The biggest and most disadvantive method of phishing is the use of online banking, as hackers target your bank account. If you use any type of online banking then you can do very carefully with the website that you are putting in the related information from the bank. It is a phishing page, and thereby stealing all the information related to hackers from your account. So friends Every time you use online banking, you can use it only with a trusted way. If you look anything different then you can not include any information related to your bank account. Friends, do you know that the social networking sites you use like Facebook, Twitter, Gmail etc. Sometimes Hackers take their support to steal all your information and how does this happen? Many times what hackers do, they create the same phishing page as the same social site, which send the link of that page to your social website, and you can give them any kind of greed on that link as you would Much like. If Friends are ever with you and you are already on the social site and clicking on a link again asks for your password and username again, you should never share your password or any Personal Information on that page. Friends hackers create a faked page in the name of some popular websites, which you can send also for which you have to login and when you login in it all your information goes to the third party. To avoid this, first of all, you have to check that this website has to be logged in this way, because the website does not ask for any more information. Final Word: Friends Nowadays, many of the phishing pages make you easily steal anyone's information from the phishing page, but many people do not know that it is illegal to do so. These are just a few phishing attacks from related knowledge, there are many other tricks that can make hackers targets. But if you have the right information then you can avoid such a phishing attack. If you liked this post, please do not forget to share it, without your support, I can not reach this knowledge even further, so help me by sharing my post so that I can bring you a tricks more than one To share the post, you can use the share buttons given below. Thank U and Good Bye.